Whether you’re celebrating the holidays or hosting a conference, amaze your guests with Tampa Bay’s most stunning corporate event space. Corporate/Conventions: Yacht StarShip offers Florida’s Largest Fleet of Dining Yachts, with award winning service and cuisine! We are America’s First 3-Diamond Rated Dining Yacht, ranking our yachts in the top 28% of all restaurants. With four fully air-conditioned luxury yachts, we are the perfect venue for any corporate event from 25-600 guests. Dockside events can accommodate up to 1,200 guests. Yacht StarShip I is the only dining yacht in Tampa Bay with an elevator servicing all 3 passenger decks. Holiday Parties: Book your holiday party aboard Yacht StarShip and see why we were voted #1 Holiday Party Venue of 2015 by Tampa Bay Business Journal! As Tampa’s #1 Holiday Party Venue, dates go fast so reserve now and let us “wow” your guests with award winning service and cuisine! 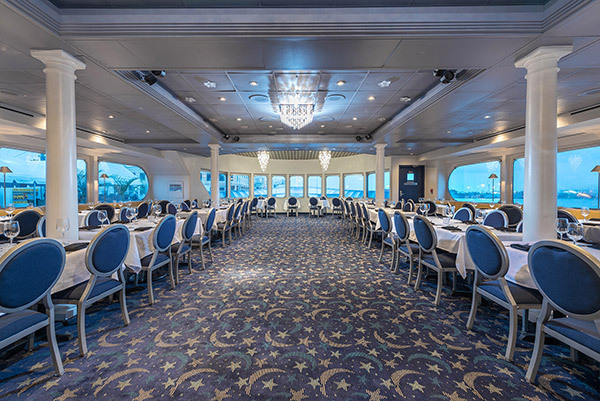 With 4 yachts and private dining rooms, we have the perfect banquet halls for corporate events and holiday parties from 2-600 guests. Team Building: Great teamwork is one of the key factors associated with a company’s success. Invite your team for a day of team-building with a beautiful sunset cruise in Tampa, Clearwater or private charter in St. Petersburg! Enhance social relations with collaborative team-building tasks! Enjoy games and training exercises outside of the office that are fun and beneficial for all involved. Meetings & Conferences: Yacht StarShip offers meeting space for groups of all sizes. Whether you’re hosting a board meeting, luncheon or conference, we have the perfect package for you. Thank you to you and your entire staff. Our group loved our time aboard the ship and can’t wait to do this again. Everyone on the team enjoyed the evening we will certainly go back again in the future. Thank you so much for all your help I very much appreciated your partnership in making the evening the success it was. Everyone thoroughly enjoyed their evening aboard the Yacht Starship. They said the food was fantastic, the DJ great and the staff absolutely outstanding. I truly enjoyed working with Eric on the pre-trip aspects of the evening. He is truly a professional. We had a lovely time during our cruise, our group really seemed to have a great time! Dan was very hospitable and really gave great guidance in helping us with getting our activities timeline together and made everything very special for our guests. The crew was very attentive and made us to feel very welcome. Thank you so much. We had a great time and everyone seem to really enjoy themselves. Thank you again for everything and I will keep you in mind for future events. Thank you and the entire StarShip team for being some accommodating yesterday! Our group had a great time and everything went as smoothly as possible thanks to all of you. The entire staff was awesome. From the greeting staff to the captain. I would highly recommend. We were very pleased and everyone had a GREAT TIME. We will certainly do this again in the future when we return to Tampa! Thank you for working with us on a suitable menu. The food was good and the service was excellent. Everyone had an amazing time! The food was great, the DJ was awesome and all of the families commented on what a great idea it was….to all be together to celebrate the Championships. Thank you again for all of your help! We had a great time on the ship. Our suppliers told us that it was the highlight of the conference. We will definitely be using you guys again. Your staff and crew were unbelievable and “Top-Notch”. In particular, Shei and David helped us so much. Those two are special and we really feel lucky to have got to meet them. Thanks to you and your amazing team, we had an awesome event that people are still talking about! From the food, to the DJ, to the cookies when you left the boat, everything was perfect. The cruise was wonderful and people have been talking about it all day! We can’t wait to do it again. Thank you so much. It was a total success. Everyone had a great time and the food was awesome. I honestly can’t say enough nice things about the crew – from the captains to Chantel who cut the meat – they were first class all the way. The Way 2 Dance Celebrated 7th Year Anniversary on the Yacht StarShip in Tampa! What an amazing venue to get away for few hours with your friends and/or significant ones and spend quality time chatting, eating excellent food, laugh and dance! Everyone had such a fabulous time! Thank you ALL and big THANKS to the Yacht StarShip Dining Cruises crew and Lauren Ibey for making this experience pleasant and memorable! We had a FANTASTIC time! It was the perfect venue for such a nice evening. Might have to get the big ship next year! We absolutely loved our cruise. The staff was extremely friendly and attentive. Your photographer was fun and did a great job with our complete picture order. We definitely will be back! I will also be booking a personal dinner cruise for my husband and I to enjoy after the first of the year. Thank you so much for making all of us feel special. It was so good to see all our Leaders relax and enjoy the lunch cruise. Have a wonderful holiday season! The group had a wonderful time aboard the Yacht StarShip II last night! The staff was extremely professional and everything from the food, music and entire experience was something everyone’s still talking about this morning! So thank you so much for making this year’s holiday experience one we will most likely repeat in the future! Kuddos to your team!